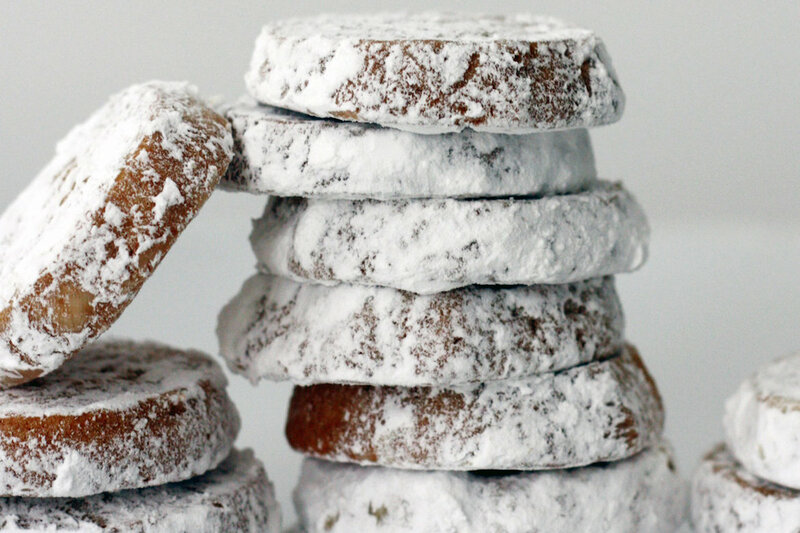 Greek Christmas is not complete without these white, fluffy shortbread cookies known as kourambiedes. They are a standard item on a Greek table during the holidays right alongside their darker cousins, melomakarona. Their main ingredient — butter — should not be taken lightly. In fact, the secret behind the success of these cookies is how long you beat the butter in your mixer. Beating the butter until very fluffy — a good 10 minutes or more — makes these Greek shortcake cookies especially light. See the full recipe below. In a large bowl, using a handheld electric mixer, beat the butter at high speed until light and fluffy, about 10 minutes. Add the egg yolk, brandy and vanilla and beat until smooth. Sift the flour with 3/4 cup of the confectioners’ sugar, the baking powder, cloves and salt. Add the dry ingredients to the butter mixture in 3 batches, beating at low speed just until smooth. Scrape the dough onto a large sheet of plastic wrap or wax paper and roll into a 2-inch log. Wrap and refrigerate until firm, at least 30 minutes or up to 3 days. Preheat the oven to 325°. Line 2 heavy baking sheets with parchment paper. Unwrap the dough and roll it into a perfect cylinder. Cut it into 3 equal pieces. Slice each piece crosswise into 12 cookies and arrange them on the prepared sheets about 1 inch apart. Bake the cookies on the top and middle racks of the oven for 20 minutes, or until golden on the bottom; shift the sheets from top to bottom halfway through baking. Let the cookies cool slightly on the sheets, about 15 minutes. Pour confectioners’ sugar into a large shallow bowl. Add the warm cookies in batches and heavily coat the tops and sides. Transfer to a sheet of wax paper that has been dusted with confectioners’ sugar and let cool. Make ahead! The cookies can be stored in an airtight tin between layers of wax paper for up to 2 weeks.